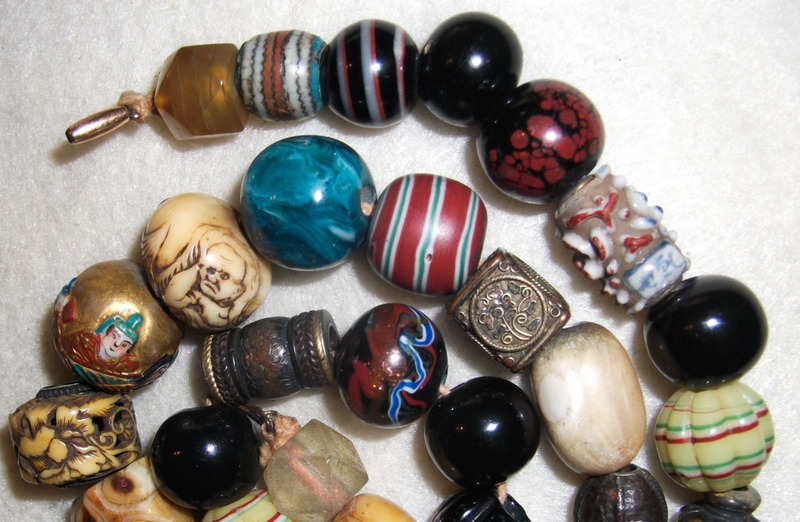 Close-up pictures make these beads appear the size of golf balls. 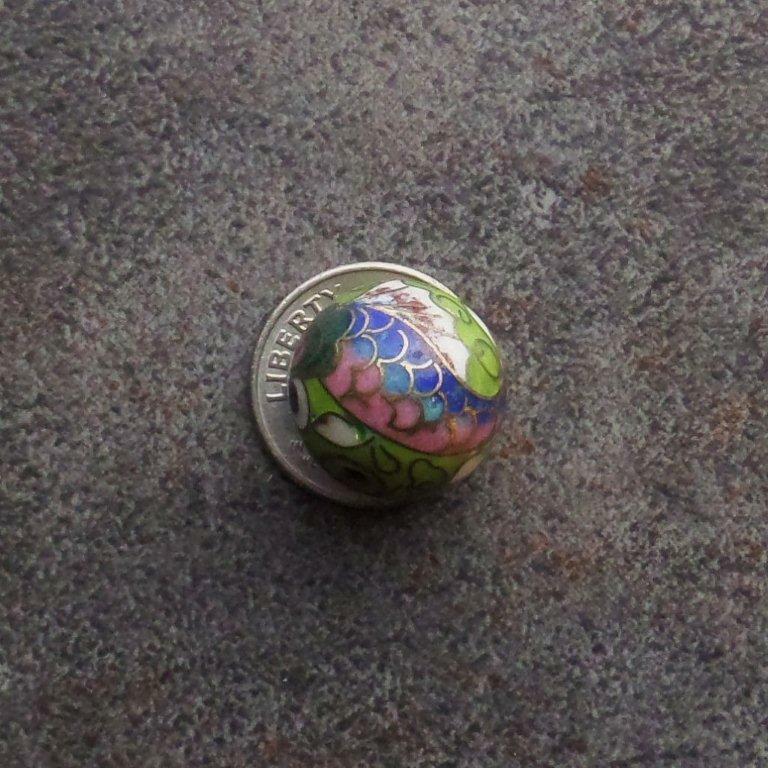 The Chinese goldfish bead from the previous picture is shown atop a U.S. dime coin in an attempt to provide some sense of proportion. 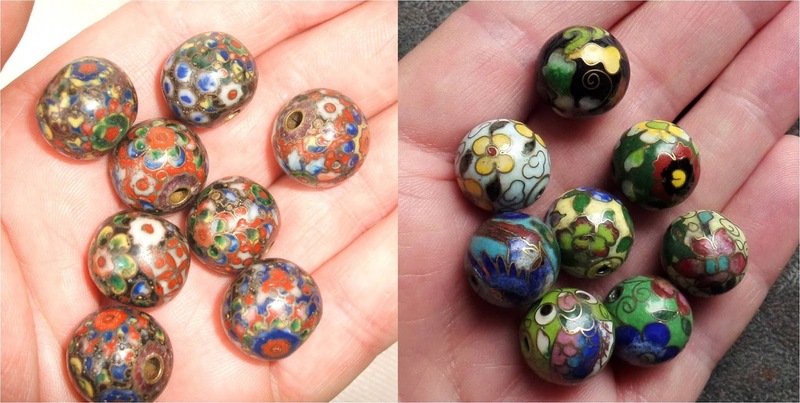 Over the years at the beadcollector.net forum various other Japanese cloisonné beads have been discussed, including a set owned by Stefany Tomalin that appear to be similar to those in the eBay sale. 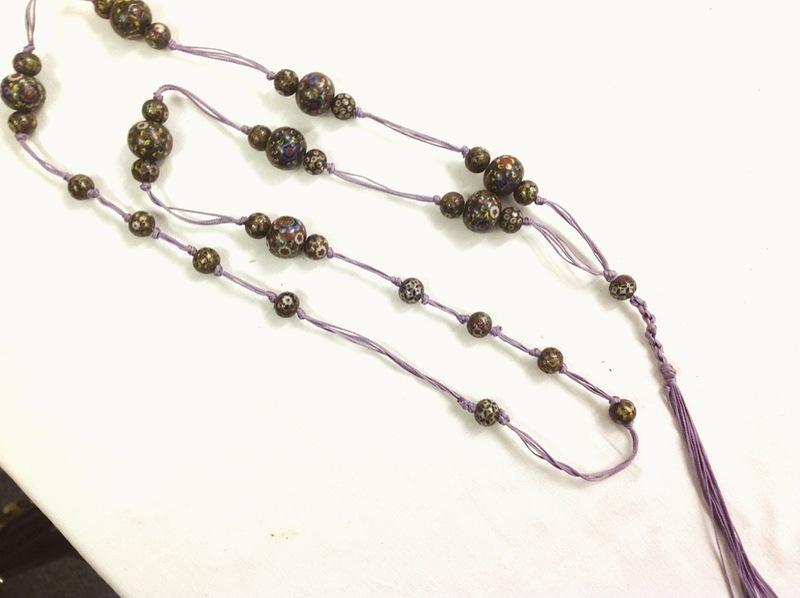 Larger beads are 18-20mm, smaller are 12mm. 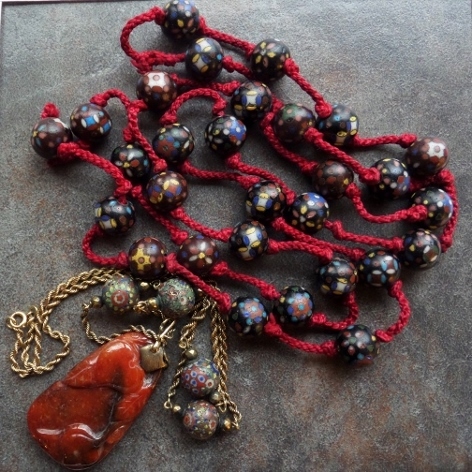 Stefany's beads appear to have a better polish. Beadcollector.net forum discussion of these beads. 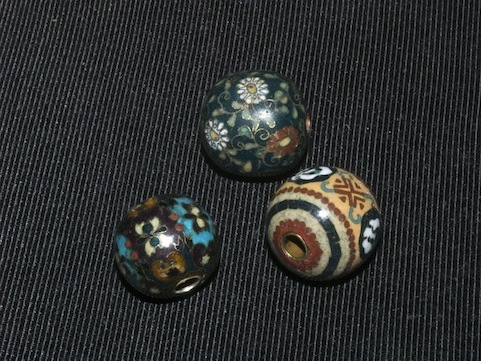 Striped bead at top, second from left, is cloisonne. Beadcollector.net forum discussion here. 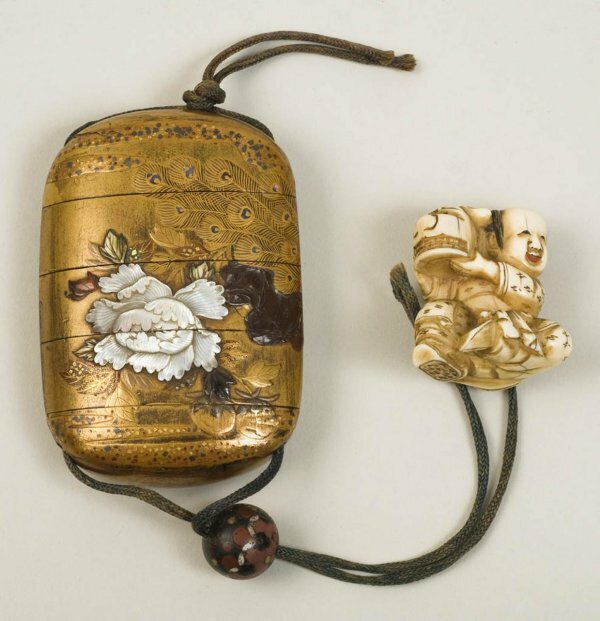 Gregory Irvine, in his book Japanese Cloisonné Enamels (V&A publishing, copyright 2011) shows an illustration on page 18 of an early enamel inro, ojime, and netsuke set dated to 1800-50, in the collection of the Victoria & Albert Museum. I wonder if the string of ten ojime resembles the other Japanese beads found in in the U.K. by Stefany Tomalin and worth1010 on eBay? The Victoria & Albert museum website lists their accession number, but states they're in storage and provides no picture. In color plate Fig.8 he illustrates netsuke and ojime with opaque enamels dated to the 19th-early 20th centuries, similar to the set quoted from Irvine's book above. 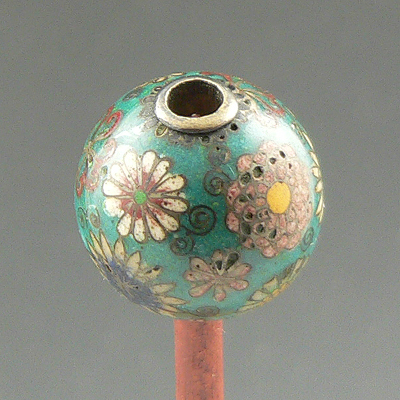 For those interested, a quick flyover of Japanese cloisonne is provided by the Victoria & Albert Museum. 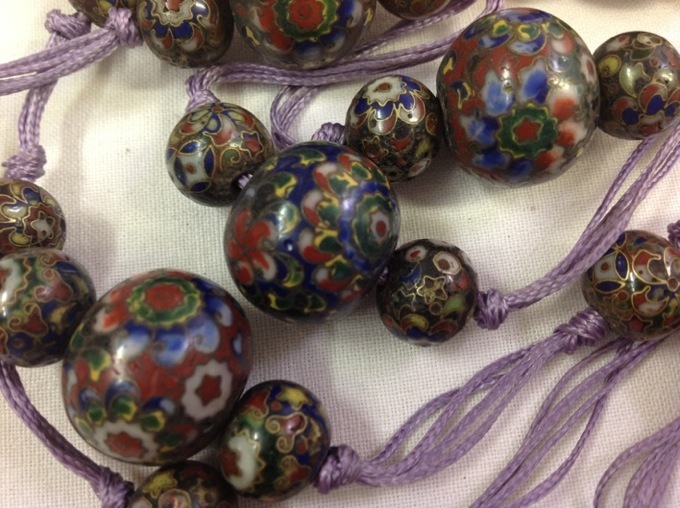 UPDATE: Some more examples of Japanese beads, plus a link to the Internet Archive for The Industries of Japan: Together with an Account of its Agriculture, Forestry, Arts and Commerce, from Travels and Researches Undertaking at the Cost of the Prussian Government, by Johann Justus Rein, published in New York by A.C. Armstrong and Son, 1889. Pages 492 onward contain a rare detailed account of the Japanese cloisonne manufacturing technique. UPDATE: U.K. eBay vendor buckinghamshire_antiques discovered two Japanese cloisonne plates that seem to be excellent illustrations of the 1870s style described above in the quote from Fredric Schneider. Notice the small clouds forming a background pattern on the morning glory plate that appear to be identical, in both shape and arrangement, to the pink clouds on the turquoise ojime pictured above. 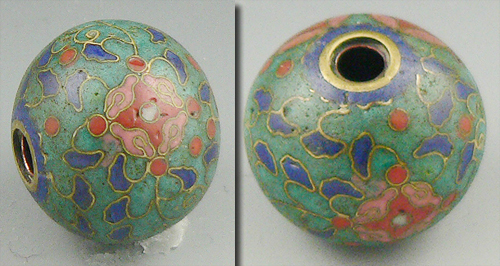 UPDATE: More stunning examples of cloisonne ojime from the collection of Frederick Chavez can be found at the beadcollector.net forum in two posts here. Click through and view these, they are not to be missed! 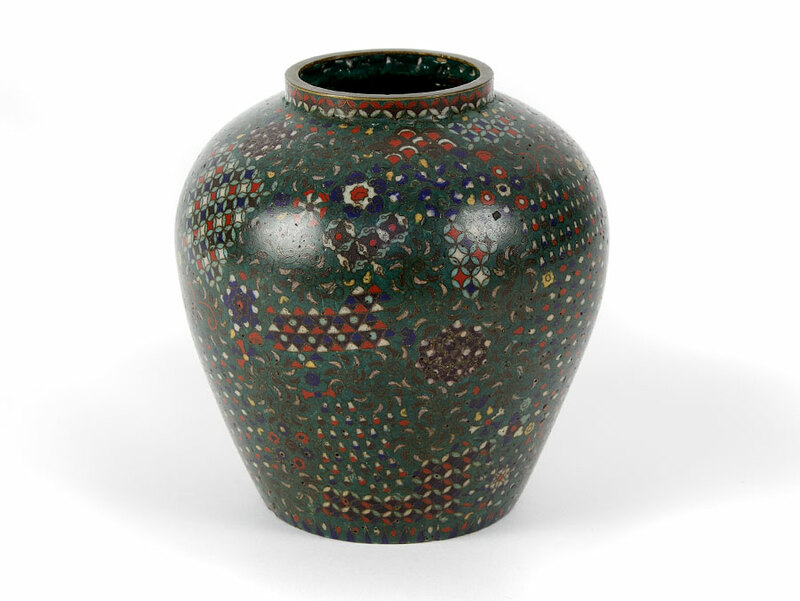 UPDATE: ParadeAntiquesBlog has a set of 6 pictures of a "c1860 Kaji Tsunekichi Style Japanese Cloisonne Vase." Note the arrangement of the little cloud motifs (between the two shiny reflections). Be sure to view the other 5 pictures! 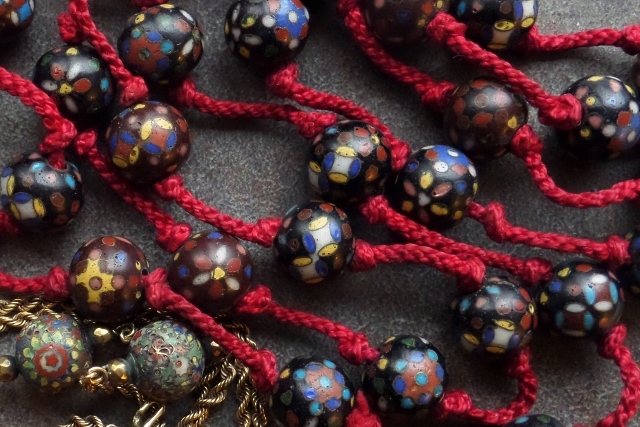 UPDATE: Another beadcollector.net thread, comparing doro shippo and 1868 Meiji cloisonne beads, with fabulous examples from the collection of Frederick Chavez.